Orthodox Church liturgical Subdeacon clergy vestments (white-gold) by Istok Church Supplies Corp.
Beautiful Orthodox Christian liturgical vestments are a sight to behold. Not only do they set the mood for worship, but they also increase the prestige of a church within the community. For Subdeacons, we offer elegant Subdeacon vestments (white-gold) that combine tradition, beauty and practicality at prices you will simply love. In Orthodox Christian church practices, a Subdeacon plays the important role of assisting a Bishop during hierarchical services and leading the team of servers so liturgical services can go on uninterrupted. 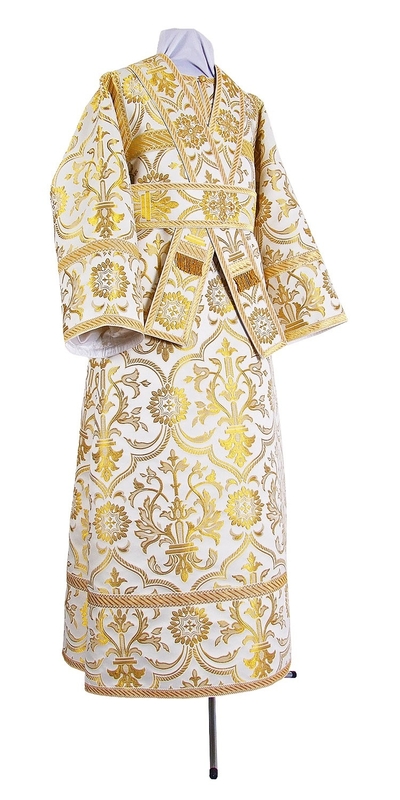 Our classy Subdeacon vestments (white-gold) are available in three different fabric options – metallic brocade, rayon brocade and Chinese rayon brocade. Whether you prefer the Christian themed patterns on rayon and metallic brocade or the floral patterns featured on Chinese rayon brocade, you will not go wrong with your choice. White symbolizes purity and our Subdeacon vestments (white-gold) are perfect for church services that commemorate the Lord and the Bodiless Powers. The beauty of our sub-deacon vestments is enhanced by the quality decorations we provide in the form of crosses and trims. We offer adorning in three distinct styles – economy, standard and premium. While we provide 100% natural rayon lining for all our sub-deacon vestments, customers can upgrade by adding natural velvet inserts to their orders. When you are doing your liturgical duties in front of the community, you want the best fitting vestments that add to your stature. To ensure this, we provide made-to-measure services rendered by experienced ecclesiastical tailors with complete knowledge of Orthodox Christian vestment customs and traditions. Every order is executed with close attention to detail and craftsmanship. This takes a considerable amount of time and we request you to provide your custom measurements and place orders early so we can ship as quickly as possible. We offer a safe and secure ordering process with multiple payment options and worldwide shipping. Start browsing and find the perfect Subdeacon vestment worthy of your church!